It was a sunny day in Brussels, Belgium. "It's NOT Raining Again" would have been "The Logical Song." The prestigious SAS hotel had some businessmen discussing politics in the hotel bar. Tucked away in the corner sat the man responsible for such all-time classics like "Dreamer," "Take The Long Way Home," "Give A Little Bit," "Breakfast In America" and "School" to name but a few. 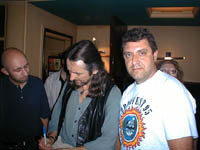 Together with Rick Davies, Roger Hodgson was for a longtime the songwriting centre of the world-famous band Supertramp. This Lennon and McCartney of the progressive rock supergroup sadly parted company after sales in excess of 50 million albums. 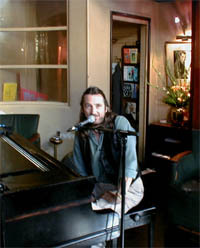 Hodgson, who turned 50 in March 2000, now resides in the mountains of Nevada where the vastness of nature inspires him to write new material. Rumours have it he has around a hundred new songs waiting to be released. Ten of them have now found their way onto the brand-new Open The Door album released through Sony France. As I am the last journalist in a hectic promotional afternoon, and as Roger has promised to offer a handful of friends and press representatives a small intimate acoustic mini-concert later that evening, I wait to fire my first question as the sympathetic Roger Hodgson munches some fresh fruit and cream. The minutes tick away and then it's anchors away! Those of you who have been going through the personal history of this onetime Supertramp icon have noticed the fact that he already released a single in '69. "Mister Boyd" was released under the name of Argosy with Reginald Dwight on keyboards. A couple of weeks later Reginald changed his name to Elton John and the rest is history. Strangely enough, if you go through the history of Elton you come across the name Reg Dwight and also of Bluesology but you never hear the name Argosy mentioned. "That's because so far all of my press releases have been mentioning the fact that Argosy was a band, which in fact it never was," says Roger. "What happened is that I got a recording contract for a single. Once we started recording "Mister Boyd" someone was drafted in as a keyboard player, yet as a session musician, and that someone was Reginald Dwight. I don't even recall having spoken to him during that session. He came in, did his bit, and then left. As far as I'm concerned I wanted Argosy to be a band but in the end my publisher didn't want that." What did you expect from Argosy and how did you manage to get a recording contract in the first place? "I was nineteen at the time, so it was all a big experience for me. It was my first time in a studio so it was a big new adventure for me. What happened is that I lived close to where Traffic was living at the time [the band featuring Steve Winwood]. I made friends with Traffic's roadie and he took my tape to London to Island music. Their affiliate Blue Mountain Music heard the tape, were interested in some of the songs and signed me up for a publishing deal and something like two singles. In fact it was when I was recording that second single that I met Rick Davies. The single was never released, as Sam, who then was the manager of Supertramp, bought me out of my contract with Blue Mountain Music for something like ?1,000. So in the end that second single was never released and is now gathering dust on my attic. It will never be released and also won't make it as an MP3 on my website that's for sure!" Not so very long afterwards you wrote "Dreamer." Did your initial demo differ much from the actual Supertramp recording? "No it didn't, as we tried to duplicate [it] as much as possible. I even think we played the demo on two tracks and then tried to duplicate as much as possible. I had an out front mixer which we used to tour with at the time. I took that one home with me and set it up in the backroom somewhere. I didn't have any drums, and drum-machines didn't exist at that time, so I banged on some boxes to create the percussive parts. I recorded the entire song on a two-track tape recorder." If you compare that period in your life with the technical possibilities today, do you think as a musician it's an advantage to be living and working today as opposed to, say, thirty years ago? Also, from an artistic point of view because nowadays it's so easy to press a button and to have that "loop" playing for hours on end? "I love the new technology, I really do. This new album, Open The Door has entirely been done on a computer. I cut and paste like like crazy. Some of the solos are even the result of cutting and pasting the best parts out of sometimes ten different takes. So for me it's an incredible creative tool. I haven't gone as far as to asking people on the other side of the planet to play their solos in their studio and then send it over by means of the Internet, but on forthcoming projects I might just do that." If you listen to Open The Door then one has to admit it sounds more like Supertramp than their own Some Things Never Change album. Compared to your solo albums In The Eye Of The Storm, Rites Of Passage, but especially Hai Hai, the new album certainly is a big improvement. Back to the roots as it's were. "All of these albums have been made in various periods of my life. In The Eye Of The Storm I was just 'fresh' from leaving Supertramp and also in shock. I thought I had something to prove and, as I didn't have any musicians to call on, I did everything myself. I still like very large chunks of that album. Hai Hai came out in a period where I was very confused and disconnected from the music industry, disconnected from touring, so I started losing confidence and started listening to everyone else's advice. I fell into the trap of trying to make a hit because I had been away for four years and I had to make sure everyone noticed I was back, so both my record company and my manager, and in some way myself as well, felt we needed at least one hit single. On top of that it was seven years after Breakfast In America, the audience was still out there, so I tried to write a hit, but apparently I tried too hard. 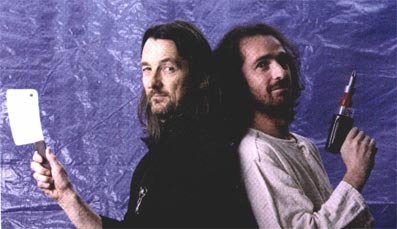 It was a very expensive album to make, I used a lot of LA session musicians who have very strong personalities and in a way Roger Hodgson got buried under all those personalities. In the end I didn't even like my own album! You are right in suggesting I [would have] better called the album 'Hush Hush,' and then one week after the release I had the accident where I smashed both wrists. Everyone who supported me had to leave because I couldn't function, so I was alone with my family for about two years. And then when I started to write music again I was totally disconnected from the entire music business, didn't have a recording contract, didn't have a manager, didn't have a band, didn't have a crew, nothing. These things don't manifest overnight, especially not if you're living outside of the music centre, and as I'm living up in the mountains in Nevada, things didn't work out easy. It's been very difficult to find myself another way in." Although it is none of my business to ask about your bank balance, I can imagine you can't have any financial problems what with having sold in excess of fifty million albums worldwide. What I mean is, you don't have to release a new album, you don't have to travel all over the world to promote yourself again. The only reason I can think of for you doing all this all over again is purely from an artistic point of view, that you want to keep on creating new songs for the world to hear. "Compact discs really kept us alive because the entire Supertramp catalogue started selling again. By means of the royalties coming in yes, I have been able to take some time off, but I'm not in a position where I don't have to work for the rest of my life, although that's not the main reason for the release of this new album." 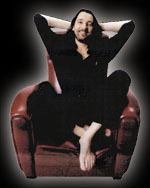 What would you say has always been the characteristic Supertramp mark in your music, what's the recipe? "Firstly the songs themselves followed by the richness of the textures like the saxophone and all the different styles we combined. The organ, the guitar solos here and there,... in fact Supertramp has always been rich in musical 'colors' especially because of the two different musical styles, because Rick has a completely different style in writing than me, yet we do complement each other. What has endured are the songs, the lyrics." You and Rick have always been labeled as the Lennon/McCartney of your era, which is a wonderful label to be given. I know from the Beatles history that Lennon sometimes wrote a song all by himself but nevertheless credited the song to Lennon/McCartney whilst the same thing happened when Paul wrote a song all by himself. Did the same thing happen with you and Rick? "Completely. In fact we never ever wrote together except for the first album, the 'rose' album. From Indelibly Stamped onwards we never wrote together. In fact, if we had been crediting the songs to whoever really wrote them [that] would have accelerated the separation process and maybe would have started arguments such as 'my single has to be the next single' or 'you have five songs on the new album and I only have four', and we tried to avoid all that and just credited all of the songs to Hodgson/Davies." Because the Supertramp music wasn't restricted to the three-minute length, were some of your songs the result of the combined creative skills of both yourself and that of Rick's into one song. What I mean is, are there any songs of which the first part was written by yourself and the second part by Rick and where all of the band wrote a "bridge" between the two parts? "There's this song 'Just A Normal Day' on Crisis? What Crisis? where Rick sings the verse and then I wrote the chorus in answer to his verse. But generally whoever wrote the song also sang it on the album so Rick sings his songs and I sing mine. We would however help each other out in the arrangement department. Rick would come up with some off the wall type of ideas on some of my songs and I would come up with a lot of the melodic and harmonies on some of his songs. It worked very well." Do you still feel bitter about what happened? Especially after listening to Open The Door, which is a true Supertramp album all the way, and you're not able to put the name Supertramp on the album! "I certainly don't feel bitter. I made my bed and I've got to lie in it. Obviously it would be nice if I could still use the name Supertramp, which would mean I wouldn't have to work so hard to promote my career again in this time of my life. I'd prefer it if I'd have more time to concentrate on my writing as opposed to go on tour to promote myself." Do you still follow what Supertramp is doing? Do you still check out their music? "Yes I do. In fact it's no longer Supertramp's music, it's Rick's music. 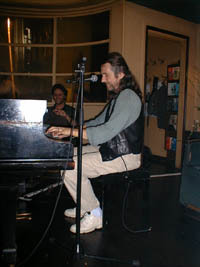 To the world it's still Supertramp but in fact what you hear now is Rick's music. He can use the name Supertramp because I was so foolish to give it away. When I left I gave the name to the four of them, but then when the four of them split up in '88 Rick inherited the name. That was the internal agreement we had with each other. Maybe I was a little foolish? What's happening now though is what I had expected all along, meaning that people still want to hear my voice and want to hear those songs. Even after twenty or so years people out there still want to hear the Supertramp music from way back then. Rick has released what, four or five albums, and none of it made an impact." When Rick Wakeman released his Return To The Centre Of The Earth album, I talked to Sir Richard Lyttleton, head of EMI Classics and he told me Rick proposed one of those eastern philharmonic orchestras "because they were cheap," but then Lyttleton suggested the London Symphony Orchestra because, although very expensive, they are the best and Rick needed to have the absolute best. Was the use of the Symphony Orchestra from Prague mainly because of the budget? "To tell you the truth, it was marginal to whether at all we were to use an orchestra on this album. As there are different colors on the album we brought them into the studio and some of the stuff worked and others didn't. I don't think the orchestra plays a huge part on this album. The Prague Orchestra is a great orchestra and yes they are inexpensive. Even if the best orchestras in LA and/or London might be better than them, it still is more special for our friends in Prague to be lined up for a project like mine. They are more open for improvisations, for new ideas as opposed to the more strict classical approach from, say, the LSO." "The More I Look" on the new album is a song on which Trevor Rabin collaborates. Now I know that Trevor approached you several years ago to try something new, resulting in a collaboration ended up on Yes' Talk album. Was there ever talk of you joining Yes as their new vocalist? "I think Trevor initially came to see me because they were having big problems at the time with Jon Anderson. Trevor felt he was shouldering all of the musical responsibilities within the band so he was sort of looking for a partner to help him out during these difficult times. I don't recall him asking me to join Yes, which in a way would have been ridiculous. I think he was more looking into forming a new band with me, Trevor, Alan White and Chris Squire. It would not have been Cinema because the initial Cinema material was in fact released on the album 90125, because fractions before releasing the album, Jon Anderson heard the material and rejoined the band." Chris Squire recently released Conspiracy, a joint effort with Billy Sherwood. Do you also find it interesting to have younger people put the fire back into the music? "I think I met Billy once, but yes it's always interesting to share the views of our younger generation. My son Andrew keeps me informed what's happening because there's too much material out there to really be aware what's going on. If it weren't for Andrew I'd be totally out of date, wouldn't know what is happening at all. I don't spend too much time listening to someone else's music. I no longer have 'idols' of which I would buy every new album. However, I always check out the latest Genesis album, latest Pink Floyd album, latest Sting album, Peter Gabriel, just to see what they're up to. I have so little time that I'd like to spend it with my family doing the things I like. I must confess I like the music of Tom Petty a lot, but I put it on as background when I have to work or when I drive. I no longer sit back and relax only to listen to music. I no longer have time for that I'm afraid. There are things I like such as Beck, Björk, Radiohead,... but nothing is earth shattering anymore and that's the only thing I'm on the lookout for. Peter Gabriel did some interesting things but he ran out of ideas; Steve Winwood did some great things but then he ran out of ideas. Where are the new ideas?" I leave Roger Hodgson, whom I met for the very first time only a couple of hours earlier, and it already feels like leaving behind a great friend. If only more "stars" would be of his nature, the world would be a better place. Before I leave I ask him one more question: what does the Morse code in the beginning and at the end really mean? "It actually means 'open the door,'" says Roger. Over and out!